As you recall from our last post, we were both looking forward to spending a few days parked in an anchorage next to a small cell tower so Karina could do some work and I could see about fixing the watermaker with duct tape and seizing wire. Our trip to Puerto Aguirre had been a stressful day. It was our first time "sailing in the white" while here in Chile and the winds and currents hadn't been given their daily briefing and had gone rogue. We finally passed by our last uncharted island and rounded the corner. Our eyes focused on the houses and yes, there was a cell tower. Houses meant people. Surely we could get a few fresh vegetables. Then we saw the high pier and a large 100 m ferry. Wow, this place is happening! The wind and current, sensing our arrival, switched in our favour. We blasted down the channel. I turned on our cell phones but strangely there was no connection. Karina is up at the bow preparing the anchor. Sea Rover is flying to our planned anchorage past the pier... but wait??? Is that a sailboat at the dock with a Swedish flag??? Is there a marina here that we don't know about??? We tear past the large ferry and Karina spys a small sign above the dock just before it passes out of sight. "Marina Austral, Ch 09"
Minutes before entering the channel we had tried to contact the Port Captain. As usual the officials sensed an impending difficult conversation in Spanglish and decline to answer. We assume the same will be the case for the marina and decide to tie up first and ask questions later. Karina dives into the lazarrete for lines and fenders while I struggle to turn back against the wind and current in the narrow channel. I decide to employ the bow thruster for assistance and the instruments lock up with alarms and a last depth seen of 0.5 m.
To buy time and calm nerves, we motor down to the anchorage and consider just sticking with the original plan of anchoring. But it seems we don't have cell service (a major problem for Karina) and maybe the marina will have water. This would save an emergency repair on the watermaker... We decide to try again to arrive at the dock. Sea Rover is finally turned into the wind and current and we edge closer to the giant ferry with the marina dock just beyond it. Just as we are alongside, the ferry applies both stern and bow thrusters and casts off from the pier without a horn or whistle of any kind. Mission aborted and we slink back to the anchorage to plan our next attempt. 20 minutes pass and the ferry has finally maneuvered off the pier, opening up our view to the dock. Yes, it is a marina and there is a nice man patiently waiting to take our lines. The next few days are spent enjoying new company, amazing hot showers and reasonable internet. The highlight of the stay is the marina owner Jamie, an energetic, friendly Chilean who opens up his home for us and plies us with great cuisine and wine. We fill up our water tanks, rest and relax and plan for our next and last unknown leg of the season down to Laguna San Rafael. We provision with better than expected produce from the local "supermercado" (ie, a 1 room house) and add an extra safety margin to our diesel tank. Two weeks later we return to Puerto Aguirre and again accept the hospitality of Jamie and Marina Austral. New friends are made with m/v Iron Lady and s/v Threshold and we catch up again with Rum Doxy. The neatest thing about Puerto Aguirre as a Cruiser is its location. Those going south view it as the last bastion of civilization and those going north see it as a nice cold drink of water in a dessert of wilderness. All who arrive are starved for companionship and friendships are easily made with stories of all the amazing adventures we've just completed. Jamie is a gracious and welcoming host and goes out of his way to ensure everyone enjoys their stay. This small new marina is perfectly placed and managed. It will certainly be a stop for us in both directions next year. A few weeks ago, on our way south to the glacier at Laguna San Rafael we had one of our typical days moving from one unknown anchorage to the next. STRESSFULL. Bear with me while I set the scene. After 3 days of travelling south in strong winds from varying directions, fighting contrary currents that were predicted to be with us and trying to decipher the cryptic language nuances of the two cruising guide books we are using for this area we were starting to get a little tired. Everyone who cruises has their own comfort level and the writers of guide books are no different. When they use words like 'close quarters' or 'tight anchorage' is that because their boat was 60 ft long or 20 ft long? When they talk about 'uncharted rocks' or 'difficult to navigate', is that a carry over from the 90's when Chile's charts were much less accurate or detailed or are there still hidden dangers lurking below the surface? These are all questions we deal with every day and I think we've said it before... Uncertainty is a double edged sword. Adventure is all about travelling out of your comfort level but being out of that zone can certainly wear you down. Now imagine how we felt when we were forced to add "Sailing in the White" to our daily routine for the first time this season. This is a term that strikes fear into the most hardened crusty Cruiser as it means you are now sailing without a map to tell you what is below the surface of the water. Chile's charts have improved dramatically over the past 10 years and their Atlas is a model that should be followed by every country in the world but there are still areas where the underlying depth information was determined by a guy in a row boat with a lead line in 1720. In planning our next day we unfortunately determine that to get to our next desired anchorage in a timely manner (ie: before a big forecasted afternoon blow, the current switching and darkness), we simply cannot follow the path the guy in the rowboat took 200 years ago and must shortcut through a minefield of uncharted reefs, unnamed islets and narrow passes. How could we possibly not run aground? 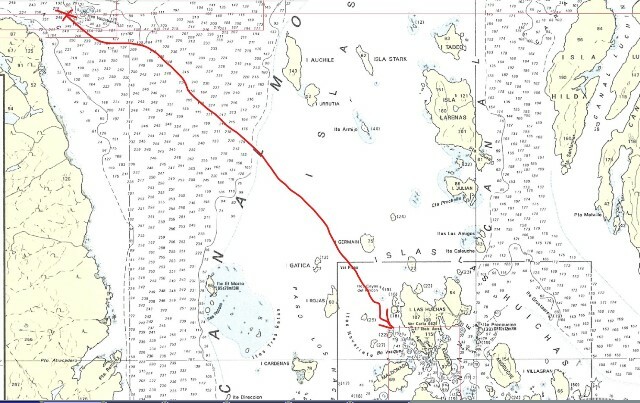 The night before this short passage is spent plying over the charts, both electronic and paper, comparing them with our cached electronic google satellite images to check for any differences along our planned route. We study the guide books for any hints of what to avoid and read all the long trip reports of those who have passed here before. Our fear is conquered by what little knowledge we have gleaned and transformed into a healthy caution. We are as ready as we can be and it's time to move on. That morning we set off and the big blow is quickly upon us and the currents are as usual not from the direction we expected. The depth sounder jumps dramatically from 200 m to 2 and back to 200. We question what we know. Are we really ready? We reef to make the boat comfortable, the current isn't slowing forward progress to a stop and we learn to slightly ignore the erratic depth sounder. We follow our planned pass and nothing goes bump. Dolphins leap, and Albatross soar while Penguins bob around us. We make it to Puerto Aguirre with no paint missing off the bottom. The great unknown is yet again pushed further ahead of us and by taking that small step it will be easier next time. 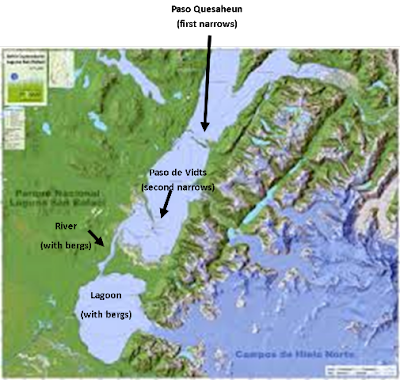 Our goal this season was to make it down to the glacier at Laguna San Rafael, roughly 450 nm south of Valdivia. I’m pleased to announce that we reached our goal on March 7th. Laguna San Rafael boasts the furthest glacier found north in the southern hemisphere at 46o 38’S. We’d been told that lots of tourists do the trip, but don’t be fooled – this area is REMOTE. You can get there by small tourists boats (at least 14 hours return from Chacabulco), small Cruise ship, or by airplane (although we didn’t see any of those). All of those methods of transport are reasonably straight forward. Travelling there in a sailboat is another matter and requires a bit of planning and a lot of guess work. The reason for this is the glacier is located at the bottom of a very long, narrow strait, that is accessed by travelling through two narrows where the current runs fierce, and down a river. The currents can run up to 6 knots and so for a sailboat where our maximum speed under motor is 5 knots, this requires careful timing of the passes and river to ensure you are travelling WITH the current (ie, on the flood). This sounds simple, and in theory it is, but as it turns out, this is where the guess work comes in. We have two guidebooks for Cruising in Chile – the “Italian Guide” and the “Royal Cruising Club” of England Guide. Both are very good and cover the vast majority of anchorages on the more well travelled routes in the Patagonian canals. Both books contain a section on Laguna San Rafael. One informs the reader that slack water (which in my understanding of the term means that current is not flooding or ebbing, but has stopped moving – always the best time to cross a narrows) occurs 2 hours behind the tide times listed for the tidal station at Bahia Orange (plus 1 hour for daylight savings). Having not come across Bahia Orange before, we did some research and realized it is the tidal station located at Cape Horn, 700 nm to the south! OK. We find the tide charts for Bahia Orange. Great. We check our chart plotter, which conveniently has tides for Paso Quesahuen, the first narrows, and decide that the numbers match. Yippee. We then read the other guide book, which helpfully tells us that high water (do they mean slack??) is 45 minutes AFTER the times listed for the tidal station at Bahia Orange. Um, what?? Is anyone else confused? Because we certainly were. Our first hurdle was getting through the first narrows at Paso Quesahuen. Since the guidebooks gave contradictory information, we chose the one that matched our chart plotter. Seemed reasonable. Unfortunately we learned, the hard way, that this timing was just plain wrong! We went through the narrows at supposed ‘slack’ with a 3 knot current with us and 25 knots of wind at our back. It was an interesting ride, to say the least. Luckily the weather turned poor and so we had a few days to lick our wounds and to re-think our strategy for attacking narrows #2 and the river. Being a Scientist, I’m always frustrated by incorrect or confusing information. It stresses me out, especially when it creeps into my sailing life. So, I spent one afternoon with a pair of binoculars, clock and a notebook and watched the current and tide just outside our anchorage. According to one guidebook (and our chart plotter), high tide and supposedly slack tide were supposed to happen at 1401. I started taking written observations at 1340. 1350 – current still flooding strongly; oops - pass looks really choppy and nasty, but it might actually be dolphins leaping out of the water. Need to look closer. 1401 – current still flooding strongly. Yup, definitely dolphins leaping. Cool. 1500 – tide still rising, current maybe slowing down? 1515 – tide at max, current seems to have switched? And so on. As near as I could tell, high tide (and slack, which seemed to correspond) happened an hour AFTER the tide indicated by Bahia Orange (without adjusting for daylight savings). It turns out we weren’t the only ones confused by this contradictory information. Our friends Annette and Mike on Rum Doxy, who we first met in Mexico back in 2016 and met again just north of Laguna San Rafael, were also confused. On March 7th, after five days of waiting out bad weather, the sun shone brightly and it was time to make our run for the Laguna. Mike went up the mast of Rum Doxy to look at the water outside the anchorage to assess when the current would switch in our favour. Then we all got impatient and decided to go and see what happened. Based on my previous observations, I felt that the next pass would probably turn either at 1230 or 1330 (still wasn’t 100% sure). We aimed to get there at 1230, but then ended up sailing down Bahia Elefantes and arrived at 1330, just as the current was turning. Perfect timing (or good planning.. or guessing). We rode the flood through the next bay and finally into the river. And here we met our next challenge. Bergy bits. These mini-icebergs (in addition to some full fledged ice berg daddies) get pushed out of the Laguna on the ebb tide/current and flow up into the river and the bay immediately north. While they are pretty easy to dodge, it was a surreal experience. The whole trip from the narrows to the mouth of the Laguna took about 2 hours. The tidal currents were fierce and confused where the river emptied into the Laguna and at first the path through the wall of ice before us seemed unclear. Luckily, a path emerged as we got closer, and then, Voila! We were there! And it was spectacular. The glacier is located at the far side of the bay, which is probably 8-10 nm wide. We came out of the river into a fairly open area (ie, ice free) and were able to get our bearings. Rum Doxy and Sea Rover II were the only beings for miles around. After drifting slowly with just a single reefed main, Gary got impatient for speed and put out half the genoa. Next thing I knew, we were cruising through the lagoon at 4 knots (too fast to truly enjoy the quiet beauty of the location in my opinion, but Gary was happy). Despite our initial thought that there was “ice everywhere”, on closer inspection it turned out there was an area full of ice, pushed by the days wind, and there was a reasonably open area with a few bergs here and there. This is where we sailed. It was magical. We made it about half way across the bay, but unfortunately, our time ended too quickly as the day was getting long and the tide/current in the river was due to switch (or so we hoped). After a quick stop to put the dinghy in the water to get a closer look, we reluctantly turned around and headed back to the mouth of the river. We arrived before the switch from a flood to an ebb and fought our way up the river for a half hour, before the current changed in our favour and swept us (literally) back out and through the pass. The river landscape was completely different on the way out as there wasn’t a bergy bit to be seen – they’d all been returned to the river on the previous flood. After a long day, we put the hook down as the sun was setting. A glorious day. We celebrated our accomplishment by having drinks with glacier ice plucked out of the ocean in the lagoon. Marvelous.